I wrote recently about being someone who needs frequent change and I am definitely in a period of change in my life. I’ve changed jobs, finished studying, changed the decoration in my apartment and now as you can see I’ve changed my hair colour. A change in hue was overdue and that has now been rectified. Balance restored. 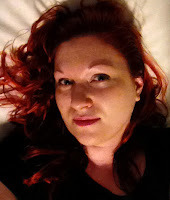 I’ve gone back to red hair, mainly because I wanted to go darker for the winter, partly to give my poor locks a rest from bleach but also because I tend to have a regular three-yearly-ish cycle between red and blonde and the time had come. The last time I had red hair, I was living in Sydney in the summer sun sure I had left England behind forever. Now I am looking out onto English winter snow wondering what changed in me that I can now see the beauty of this country and feel as though this is really home. A change is as good as a rest, they say, and I believe that is true. The main thing I have learnt in this life is that when things look bleak, when days feel as though they are blurring into one insignificant haze and that sense of being unsettled comes over me, change is the cure. I was re-capping the books I read last year (it still feels strange to be referring to 2012 as last year) and decided to name my top five of the year and also my top five upcoming titles this year, that is 2013, which also feels weird to say. So my top five books released in 2012 are the following, and this I have based on both the enjoyment I got from reading them at the time and the lasting impressions that stuck with me long after I had read them. 1 The Blinding Knife by Brent Weeks. 2 Tomorrow The Killing by Daniel Polansky. 3 City of Dragons by Robin Hobb. 4 Red Country by Joe Abercrombie. 5 Knife Sworn by Mazarkis Williams. 1 The Republic of Thieves by Scott Lynch. 2 Blood of Dragons by Robin Hobb. 3 The Blood Mirror by Brent Weeks. 4 Sworn in Steel by Douglas Hulick. 5 Scrivener’s Tale by Fiona McIntosh. The Republic of Thieves we’ve all been waiting for. Enough said. Fingers crossed we get that this year. Blood of Dragons is the conclusion to Hobb’s The Rain Wild Chronicles, which began slowly but has now secured its place as a Hobb great. Brent Week’s third book in the Lightbringer series is securely on my list after the impressive The Blinding Knife. Sworn in Steel is perhaps a quiet contender but again one I’ve been waiting for having really rated Among Thieves. Fiona McIntosh’s Scrivener’s Tale is perhaps the wild card – being a huge fan of her later trilogies I’m curious how this stand alone will have turned out after her break from fantasy. 1 Pantomime by Laura Lam. 2 Throne of the Crescent Moon by Saladin Ahmed. Some great reads and some highly recommended authors, though of course not a definitive list. Go enjoy and share your own.